Do you struggle with the need to deliver high quality applications at a seamless non-stop pace – supporting a rapidly growing number of users with fewer resources? New advances in integrated testing solutions will improve the productivity of your staff and help you respond more quickly to these challenging business requirements. 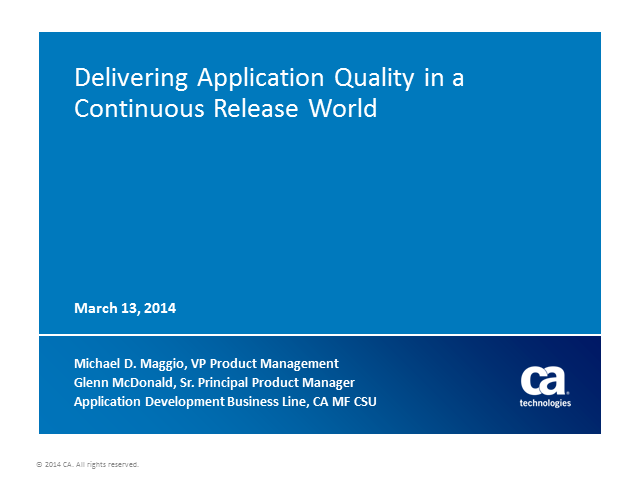 Find out how a comprehensive testing lifecycle, integrated with software change management and automated application deployment, can help you meet the challenges in a continuous release world while maintaining overall application quality. The promise of achieving Service Level Agreements (SLAs) while also lowering Monthly License Charges (MLC) has quickly captured the attention of global business and IT leaders across multiple industries. The dilemma: IT must provide the best possible service to the business, while the business must prioritize cost containment strategies. It's a paradoxical situation. Now is the time to move from hype to reality. This webcast features a panel of CA and user subject experts that will examine real use-cases. The payoff? How automated, dynamic capacity intelligence helps remove the guesswork from MLC pricing – helping to better predict capacity spikes across the IT landscape - leading to significant savings. The evolution of adaptive expert systems on the mainframe is essential to digital business innovation. Discover how machine learning and operational intelligence will help you detect abnormal patterns to predict performance problems earlier, and foresee not just what may happen, but what you should do about it. Whether you’re a mainframe performance novice or a seasoned operations expert, don’t miss this opportunity to learn how you can isolate root cause faster and trigger automated remediation to improve MTTR and your overall IT ops efficiency. Outgrowing your homegrown scheduler? Join us for this webcast to learn industry perspectives and the real-world business potential of CA Workload Automation. Guest speaker Dean Davison, Principal Consultant, Forrester will discuss findings from the Total Economic Impact (TEI) study for CA Workload Automation - a commissioned study conducted by Forrester Consulting on behalf of CA Technologies. Learn how companies implementing CA Workload Automation can potentially realize $2.3M in NPV, 245% ROI and payback in 6.2 months over a risk-adjusted, three-year period. What’s more, Jack McCarrick, Sr IT Consultant, eClaro will review why his organization selected CA Workload Automation, how it was integrated, and what the IT resource metrics and financial results revealed. Would you like to cut complexity across all phases of app development and deployment? Join us for this straightforward discussion on how CA Application Lifecycle Conductor reduces risk through a single source-of-truth. CA Application Lifecycle Conductor automates and manages the software development lifecycles that span mobile-to-mainframe environments — from the initial service desk ticket to the deployment of the application in production. Are you ready to simplify application lifecycle management—from mobile to mainframe? Corporations increasingly rely on their enterprise services bus (ESB) as the communication center to link multiple IT systems, applications and data. Unfortunately, when something goes wrong in the ESB it can have a cascading affect, impacting critical applications. Determining the root cause of the problem is a challenge for most IT organizations, since ESBs serve as a ‘black box’, offering little insight into the issue. Now, you can assess and resolve performance issues for applications that communicate across your ESB, before they affect your users. Join Richard Nikula, Vice President, Product Development and Support at Nastel, to learn how Nastel AutoPilot for CA Cross-Enterprise APM lets you analyze application behavior in real-time in production, test and development environments. Mainframe data is at the heart of the data center and critical to the success of your business. Do you have regulated or sensitive data on the mainframe, but struggle to locate it for compliance and audit requests? The game has changed for mainframe security. CA Data Content Discovery can help. Protect what is critical; delight your auditors. In the application economy, the mainframe is more relevant than ever. IT operations professionals who support mainframes often face the challenge of adapting to the platform’s evolving role and defining its value to the business. So, how can you do it all now, while preparing for the future? Build new value with your mainframe platform – for now and for the future. Are you losing sleep over the need to continually improve DB2 database performance? Database optimization tasks can help increase performance, scalability, platform support, standards compliance, and usability. But these techniques can be difficult to process, build, test, and deploy. Rest assured there is a solution. Discover how you can optimize performance and simplify operations to unlock the power and value of your DB2 data, while reducing costs and risk. Join CA Technologies hosts - Vikas Sinha, Sr Vice President, Database Management and DJ Joshi, Sr Principal Product Manager, Database Management - as they reveal new enhancements and features such as zIIP exploitation and IDAA support. Is your DB2 database being used to its fullest potential? Find out. Data matters to your business. And it’s changing every day. Growing in volume, variety, and velocity. Big Data is your opportunity to gain better insight into that information … make better informed decisions, obtain a better understanding of customers’ behaviors and needs, and tighten business operations. Get ahead of Big Data Management concerns, now. Join Sanjai Marimadaiah, VP of Product Management at CA Technologies, as he discusses how to simplify the Big Data chaos. Find out how to break down siloes and gain maximum insight to help you make critical business decisions more quickly.